I’m sorry that this didn’t get to you last week. I thought you might still want it for the recipes. Local Food and Farm Products Is this email not displaying correctly? Open House this Sunday, July 1! Mother Lode Harvest, a local foods and farm products association, is having its summer quarter Open House at the farm of one of its member growers on Sunday, July 1, from 9 am to 12 pm. The event will take place at Randall’s Corner, 4340 Hollis Lane in Fiddletown. Mother Lode Harvest members, as well as local residents who would like to learn about local foods, the association, and local sustainable farming, are invited to tour the farm to see the garden, apple orchard, greenhouse, apiary, and backyard chicken flock. Kathy Randall will discuss organic orchard and gardening techniques, preserving your garden harvest, care of chickens and bees, how to get the most out of a small greenhouse, how to start a worm bin, and much more. Children are welcome. Other participating growers will also be on hand to meet and talk to attendees. Refreshments made with local ingredients will be served. The open house will be preceded by a work party for association members from 7:30 am to 9 am. For more information, call Kathy Randall at 209-217-7373. From Fiddletown: Turn at the small bridge and take the right fork to Tyler Road. Continue for approx 5 miles on Tyler Road until you reach a 3rd small bridge at the dead end intersection of Farnham Ridge and Tyler/Bridgeport School Road turn left. Continue on Bridgeport School Road for approx 1 mile to Hollis Lane and turn right. Randall’s Corner is the 2nd driveway on the left about 500 feet up Hollis Lane. You’ll see the sign. From Shenandoah Valley: Go past River Pines approximately 1 mile and turn right on Cedar Creek Road. Continue for another 1 and ½ miles to Bridgeport School Road and turn right. Continue another 1 and ½ miles miles to Hollis Lane turn left. Randall’s Corner is the 2nd driveway on the left about 500 feet up Hollis Lane. You’ll see the sign. Take advantage of the chance to get involved in your association! We always have a sign-up sheet at the distribution center for volunteer shifts for produce intake and distribution on Mondays and Tuesdays. Working these shifts is a great way to meet fellow association members, talk to growers about gardening, and learn how the system works. Ask a volunteer, and they will tell you it is fun and rewarding! If you can’t spare the time during those shift hours, or you would like to contribute other talents, we have opportunities to fill your volunteer hours through publicity needs, helping to arrange or staff special events (see the list of events below), and tasks like sign-making and decorating/organizing. I also want to find people who would like to try their hand at putting together the newsletter. We are a great bunch of folks– get to know us better by getting involved! To volunteer, please contact our Volunteer Coordinator Carolyn Boyd at carolyn. Family Boxes are now available! If you would like to change your subscription to a family box, please notify Michelle at motherlodeharvest, or at 419-2503 by Thursday at 9 am. You can start at the end of your current subscription, or you can start right away by simply paying the difference between the two boxes. This was sent in by Gayla Chepourkoff of Always Enough Ranch, Acampo. Thanks, Gayla! I always keep a jar of olive oil in the refrigerator. When I chop garlic, I try to chop extra and add some to the jar. I also add ends and stems of herbs and left overs from a bunch of herbs. Brush one side of the salmon and the cut sides of the fruit and veggies with garlic herb olive oil. Garlic on peaches? Trust me! Try it. Put all on the BBQ at medium heat, oiled side of the salmon down, tucking the ends of the belly in so they don’t get overcooked, and cut sides of peaches and tomatoes up. I put everything except peaches on lower rack. Peaches go on the upper rack of the BBQ. Turn squash, salmon and onion once, leave the tomatoes and peaches cut side up. When done, you can chop everything up and put on tortillas, or just eat as is. Personally, I do not like to waste tummy space on tortillas! Add yogurt or sour cream if you like. Enjoy! This recipe has no added salt or pepper – I don’t think it needs them. In a large skillet, heat the olive oil. Add the onion and cook over moderate heat, stirring occasionally, until golden, about 20 minutes. Add the green beans, chicken broth and thyme, cover and simmer over moderately low heat until tender, about 15 minutes. Add the butter and cook, stirring until melted. Discard the thyme sprig. Season with salt and pepper and serve. In a large skillet, bring 1/4 inch of salted water to a boil. Add the green beans, cover and cook until crisp-tender, about 4 minutes. Drain the beans and transfer them to a bowl. Add sun-dried tomatoes and walnuts and toss. Dress with lemon juice and olive oil, season the beans with salt and pepper and serve. In a large bowl, toss the sliced squash with the vinaigrette. Transfer to a large platter. Sprinkle with the lemon thyme and the Aleppo pepper or chile powder and serve right away. 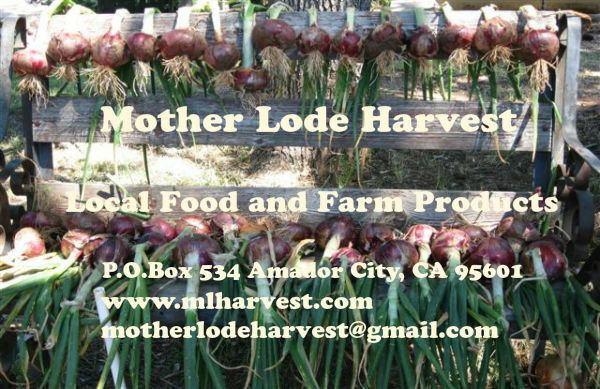 MotherLode Harvest has local food and farm products available to order at www.mlharvest.com. THE ORDERING WINDOW IS FRIDAY AT 9 AM THROUGH SUNDAY AT NOON. Orders received during that time can be picked up on Tuesdays between 10:30 am and noon, or 4:30 to 6:00 pm, at 1235 Jackson Gate Road in Jackson, behind Teresa’s Restaurant. Payment may be made at pickup by cash or check made out to MotherLode Harvest. MLH has enacted our new membership policies. Customers will need to sign a customer agreement and pay membership dues before they are able to order subscriptions or order from the website. Customer members will be able to increase their participation in MLH. Sign up today! Mark your calendar for these upcoming MLH events! Saturday, July 28, and Sunday, July 29, 10 am to 6 pm– MLH is at the Amador County Fair! Copyright © 2012 Mother Lode Harvest, All rights reserved. Our mailing address is: P.O. Box 534 Amador City, CA 95601 Mother Lode Harvest is a non-profit membership association. Sent to motherlodeharvest — why did I get this?